Jovis, 25 die Martii; Anno 11 Georgii IV ti Regis, 1830. Accounts from Audit Office, presented. No. 177. Returns, &c. presented: Hindoo Widows. No. 178. East India Company. No. 179. Accounts and Papers, presented: Public Income and Expenditure. No. 177. Four-and-Half per Cent. Duties. No. 180. Half Pay and Superannuations. No. 185. Accounts of Trade and Navigation, presented. No. 177. Report on Irish and Scottish Vagrants, sent to the Lords. Petition against Elgin Roads and Bridges Bill. Petition against Glasgow Royalty Extension Bill. Petition against Sheffield Waterworks Bill. Petitions in favour of Dewsbury Road and Bridge Bill. Petition against Wigan Branch Railway Bill. Petition against Trent and Mersey Canal Bill. Fructuozo's Nat. Bill, reported and passed. Dewsbury Road and Bridge Bill, committed. Petition against Glasgow and Kilmarnock Road Bill. Petitions against Broomielaw (Glasgow) Railway and Tunnel Bill. Catterick Bridge and Durham Road Bill, reported. Petition for Provision in Breconshire Roads Bill, reported. Petition against Radstock Roads Bill. Petition relative to the Beer Trade. New Chappel and Brighton Road Bill. The Lords request Copy of Report respecting Sir Jonah Barrington. Copy of Evidence on East Retford Election Bill. The House will send an Answer. Petitions respecting Orduance Establishment at Enfield. Petition for a Duty on taking Wheat out of Bond. Report on Highland Roads Repair, presented. No. 181. Petition for repeal of Penal Laws affecting the Jews. Petition for reduction of Stamp Duty on Newspaper Advertisements. Rye Election-Proceedings on Petition for enlarging the Time for entering into Recognizance. Leases of Lands (Ireland) Bill, committed. Arms (Ireland) Bill, presented. No. 182. Tolls and Customs (Ireland) Bill, presented. No. 183. Fever Hospitals (Ireland) Bill, presented. No. 184. Letter on House of Industry (Dublin), ordered. The House being informed that Mr. Soady, from the Audit Office, attended at the door, he was called in; and at the bar presented to the House, pursuant to the directions of several Acts of Parliament,-List of Officers and Departments whose Accounts have been usually audited by the Commissioners for auditing the Public Accounts. An Account of the Arrears and Balances due to and from all Public Accountants on the 5th of January 1829, arising upon Accounts which have been stated or declared completed to the 5th of January 1830. List of the Accounts depending in the Office of the Commissioners for auditing the Public Accounts appointed under the authority of 46 Geo. 3, c. 141, and 1 & 2 Geo. 4, c. 121, which have not been audited, stated or declared completed to the 8th February 1830:- And then he withdrew. Ordered, That the said List and Accounts do lie upon the Table; and be printed. The House being informed that Mr. Danvers, from the Court of Directors of the East India Company, attended at the door, he was called in; and at the bar presented to the House, pursuant to their Orders,-Return to an Order of the House, dated the 9th day of February last, for Copies or Extracts of all Communications and Correspondence relative to the burning of Widows on the funeral piles of their Husbands, with such Proceedings as may have been had thereon in the Court of Directors of the East India Company since the period when similar Papers were presented to Parliament. Copy of a Letter from the Court of Directors of the East India Company to the Governor General in Council at Fort William in Bengal, in the Territorial Finance Department, dated 10th March 1830. Copy of a Letter from the Court of Directors of the East India Company to the Governor in Council at Fort Saint George, in the Territorial Finance Department, dated 10th March 1830. Copy of a Letter from the Court of Directors of the East India Company to the Governor in Council at Bombay, in the Territorial Finance Department, dated 10th March 1830:-And then he withdrew. The House being informed that Mr. Crafer, from the Treasury, attended at the door, he was called in; and at the bar presented to the House, pursuant to the directions of several Acts of Parliament,- An Account of the Ordinary Revenues and Extraordinary Resources constituting the Public Income of the United Kingdom of Great Britain and Ireland, for the year ended 5th January 1830. An Account of the Ordinary Revenues and Extraordinary Resources constituting the Public Income of Great Britain, for the year ended 5th January 1830. An Account of the Ordinary Revenues and Extraordinary Resources constituting the Public Income of Ireland, for the year ended 5th January 1830. An Account of the total Income of the Revenue of Great Britain and Ireland in the year ended 5th January 1830, after deducting the Repayments, Allowances, Discounts, Drawbacks, and Bounties of the nature of Drawbacks; together with an Account of the Public Expenditure of the United Kingdom, exclusive of the Sums applied to the reduction of the National Debt within the same period. An Account of the net Public Income of the United Kingdom of Great Britain and Ireland, in the year ended the 5th January 1830, after abating the Expenditure thereout defrayed by the several Revenue Departments, and of the actual Issues or Payments within the same period, exclusive of the Sums applied to the redemption of the Funded Debt, or for paying off Unfunded Debt. An Account of the Balance of Public Money remaining in the Exchequer on the 5th January 1829; the amount of Money raised by additions to the Funded or Unfunded Debt in the year ended 5th January 1830; the Money applied towards the redemption of the Funded or for paying off the Unfunded Debt, within the same period; and the Money remaining in the Exchequer on the 5th January 1830. An Account of the Income of the Consolidated Fund arising in the United Kingdom in the year ended 5th January 1830; and also, of the actual Payments on account of the Consolidated Fund within the same period. An Account of Money applicable to the payment of the Consolidated Fund of the United Kingdom in the year ended 5th January 1830, and of the several Charges which have become due thereon in the same year, including the amount of Exchequer Bills charged upon the said Fund at the commencement and termination of the year; with Appendixes. An Account of the actual Receipt and Expenditure of the Sums placed in the hands of the Commissioners for the Reduction of the National Debt, year ended 5th January 1830. An Account of the total amount of the Unredeemed Funded Debt, and of the charge thereof, at the 5th January 1829; of the Debt and charge thereof created in the year ended 5th January 1830; and of the Debt and charge thereof reduced in the course of that year; and of the total amount of the Unredeemed Debt and charge as it stood on the 5th January 1830. An Account of the state of the Public Funded Debt of Great Britain and Ireland, and of the charge thereupon, at 5th January 1830. An Account of the Unfunded Debt of Great Britain and Ireland, and of the Demands outstanding on the 5th January 1830; distinguished under the following heads; viz. Exchequer Bills; Sums remaining unpaid charged upon the Aids granted by Parliament; Advances out of the Consolidated Fund in Ireland towards the Supplies; and, Exchequer Bills to be issued on the Consolidated Fund; and distinguishing also such part of the Unfunded Debt and Demands as have been provided for by Parliament; together with an Account of the Ways and Means remaining in the Exchequer, or to be received on the 5th January 1830, to defray such part of the Unfunded Debt and Demands outstanding as have been provided for; with Appendixes. An Account, showing how the Monies given for the Service of the United Kingdom of Great Britain and Ireland, for the year 1829, have been disposed of, distinguished under their several heads, to the 5th January 1830. Customs, England: An Account of the total amount of current Balances in the hands of the respective Collectors, and Arrears of Balances of late Collectors, on the 5th January 1830. An Account of the total amount of current Balances in the hands of the different Accountants of Customs, in that part of Great Britain called Scotland, at 5th January 1830. Customs, Ireland: A List of Collectors Balances as the same stand on their respective Accounts, for the year ended 5th January 1830: also, An Account of deceased and dismissed Collectors Balances on the 5th January 1830. An Account of the total amount of the Arrears and current Balances due on the 5th January 1830, from the Officers of Excise in England, from 5th January 1774, as far as the same can be made up. An Account of the total amount of the Arrears and current Balances due on the 5th January 1830, from the Officers of Excise in Scotland, from 5th January 1774, so far as the same can be made up. Excise, Ireland: An Account of deceased and dismissed Collectors Balances on 5th January 1830. An Account of the total amount of Arrears due on 5th January 1830, from Distributors of Stams in Great Britain, who have died or gone out of office since 5th January 1800, so far as the same can be made up. An Account of the net Balances in the hands of the Distributors of Stamps in Great Britain, on 10th October 1829, and the 5th January 1830, respectively. Stamps, Ireland: An Account of Arrears and Balances due from former and present Distributors, &c. of the Irish Stamp Department on the 5th January 1830. An Account of the total amount of the Arrears and current Balances due on the 5th January 1830 from the Receivers General of the Land and Assessed Taxes in Great Britain, from the 5th January 1790, so far as the same can be made up. Ireland, Taxes: An Account of deceased and dismissed Tax Collectors Balances on 5th January 1830. Ireland, Taxes: An Account of a Balance due by a deceased Revenue Collector on Account of Taxes on 5th January 1830. An Account of Arrears due from late Postmasters in England on 5th January 1830:-Account of Arrears due by Deputy Postmasters in Scotland, from 5th July 1813 to 5th January 1830. An Account of the net Balances in the hands of the Deputy Postmasters in Great Britain on the 5th July 1829, 5th October 1829, and 5th January 1830. An Account of Balances due from Deputy Postmasters, in Great Britain, the West Indies and British North America; also from the Twopenny Post-office, late Postmasters, in India, and the Receiver General, in the years ended 5th January 1829, and 5th January 1830. The Balance due by the General Post-office of Ireland on 5th January 1830. An Account of the net Balances in the hands of Deputy Postmasters in Ireland on the 5th July 1829, 5th October 1829, and 5th January 1830. An Account of Balances due by deceased, dismissed and resigned Deputy Postmasters (and Riding Surveyors, when in charge) in Ireland, as the same stood on the 5th January 1830. An Account of Arrears due by deceased, dismissed and resigned Letter Carriers in Ireland, as the same stood on the 5th January 1830. An Account, showing the amount of Insolvent Arrears due by deceased and dismissed Deputy Postmasters and Letter Carriers in Ireland, as the same stood on 5th January 1830. An Account of the total amount of the Arrears and current Balances due on the 5th day of January 1830, from the several persons employed in receiving or collecting the Land Revenue of the Crown in England and Wales, from the 5th day of January 1774. A List of the Public Accountants in respect of whom the execution of any process or proceeding under the Act 39 & 40 Geo. 3, c. 54, or otherwise, for recovering any Balances ascertained or declared to be due from them for principal or interest, or any part thereof, hath been controlled, suspended or prevented by the authority of His Majesty, between 5th January 1829 and 5th January 1830. A List of the Accounts delivered into the office of the Comptrollers of the Accounts of the Army, from the 5th January 1793, whereon any Balances appear to be now owing to or from the Public, on the 5th January 1830. 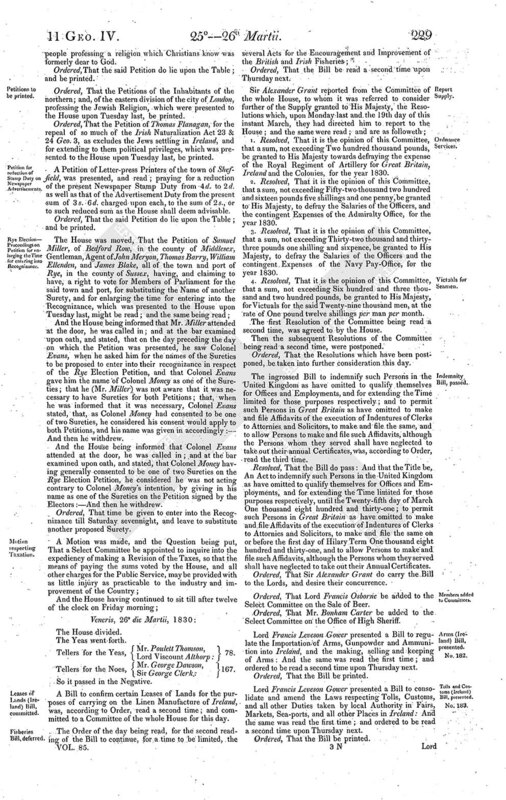 An Account of all Monies which have arisen and been received for and in respect of any Droits of the Admiralty or Droits of the Crown, and from the Surplus of the Duties called the Four and a Half per centum Duties over and above Salaries and all other annual charges affecting the same, and from all Surplus Revenues of Gibraltar or any other Possessions of His Majesty out of the United Kingdom, and from all other casual Revenue or Revenues, whether arising in or from any Foreign Possessions or in the United Kingdom, and of the application and disposition of all such Monies or Revenues between the 5th day of January 1829 and the 5th day of January 1830. Mr. Crafer also presented to the House, pursuant to their Orders,-An Account of the several Amounts paid in each of the years 1826, 1827, 1828 and 1829 for Half Pay and Retired Superannuated Allowances; distinguishing the amount under separate Heads and Departments. An Account of the number of Wine Gallons of Proof Spirits that paid Duty in each Kingdom, for the Home Consumption of that Kingdom in each year, from 10th October 1823 to 10th October 1825, and from 10th October 1825 to 5th January 1826, and Imperial Gallons of Proof Spirits in each year from 5th January 1826 to 5th January 1830; and showing for each Kingdom, in each of these seven periods, the difference of Gallons betwixt the whole that so paid Duty, and what Gallons Malt drawback was paid on under 4 Geo. 4, c. 94, and 6 Geo. 4, c. 58; as also, the total difference of Gallons for each Kingdom during the whole period from 10th October 1823 to 5th January 1830. An Account of the number of Imperial Gallons of Proof Spirits distilled in each Kingdom, exported from Scotland to England, from Ireland to England, and from Scotland to Ireland, and that paid Duty in each Kingdom for HomeConsumption, the full rate of Duty per Imperial Gallon applying to these Spirits for Home Consumption in each Kingdom, and amount thereof at that rate in each Quarter, from 5th January 1829 to 5th January 1830; and showing the Totals of all these for each Kingdom, and for the United Kingdom for the year. An Account of the number of Bushels of Malt charged with Duty in the United Kingdom, and the amount of Duty thereon, separating each Country in each year, from 5th January 1825 to 5th January 1830; distinguishing the quantity in each year used by Brewers and Victuallers, and the quantity used in the Distillery, so far as the same can be ascertained. An Account of the number of Bushels of Malt made, and the amount of Duties paid in each Collection of Excise upon the same, in the United Kingdom, from 5th January 1829 to 5th January 1830. 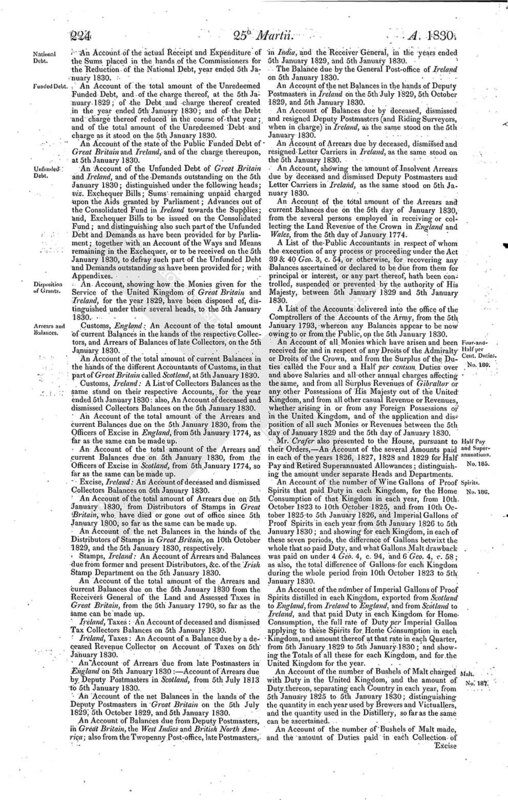 An Account of the total number of Acres of Land in Great Britain under the cultivation of Hops in the year 1829; distinguishing the number of Acres in each Parish. An Account of the Duty on Hops on the growth of the year 1829; distinguishing the Districts, and the old from the new Duty. An Account of the total number of Barrels of Beer exported from England and Scotland to Ireland, and from Ireland to England and Scotland; distinguishing the number of Barrels so exported to each Kingdom, as likewise the number of Barrels exported from each Kingdom to Foreign Countries, with the amount of Drawback paid thereon, from 5th January 1829 to 5th January 1830. An Account of the quantity of all the different sorts of Beer, stated in barrels, made in each year, from 5th January 1825 to 5th January 1830, the rates of Duty per barrel in each year, and total amount thereof in each year in each Kingdom; showing, so far as can be done, the number of Quarters of Malt used in each Kingdom, in each year, in making that Beer. An Account of the number of Barrels of Strong Beer exported in each year from 5th January 1825 to 5th January 1830. An Account of the number of Barrels of Strong, Table and Intermediate Beer chargeable to the Duties of Excise, brewed in England, Scotland and Wales, from 5th January 1829 to 5th January 1830; distinguishing the number of Barrels brewed within the limits of the Chief Office of Excise, and within each of the several Collections; particularizing the quantity brewed by Public Brewers, Licensed Victuallers, Intermediate Brewers and Retail Brewers. An Account of the number of Brewers, Retail Brewers, Licensed Victuallers and Intermediate Brewers in England, Scotland and Wales; distinguishing the number of them within the limits of the Chief Office of Excise, and each of the several Collections; and setting forth the number of Licensed Victuallers who brew their own Beer, from 5th January 1829 to 5th January 1830. An Account of the Wine Gallons of Proof Spirits Malt Drawback was paid on in each Kingdom in each year, from 10th October 1823 to 10th October 1825, and from 10th October 1825 to 5th January 1826, under 4 Geo. 4, c. 94, rate and amount thereof in each of these three periods in each Kingdom. An Account of the amount of Money paid Distillers in each Kingdom as Drawback on Malt, under 1 & 2 Geo. 4, c. 82. An Account of the Imperial Gallons of Proof Spirits Malt Drawback was paid on in each Kingdom in each year, from 5th January 1826 to 5th January 1830, under 6 Geo. 4, c. 58, rate and amount thereof in each year in each Kingdom; and showing the total Gallons Drawback was so paid on from 10th October 1823 to 5th January 1830, in each Kingdom; as also the total amount of Money paid up to the 5th January 1830 as Drawback, under these three different Acts of 1 & 2 Geo. 4, c. 82, 4 Geo. 4, c. 94, and 6 Geo. 4, c. 58, in each Kingdom. A Return to an Order of the House, dated the 18th day of February last, for a Return of all unsettled Demands on the Funds provided by the Government of France, under the Conventions of the 20th November 1815, and 25th April 1818, for liquidating the Claims of British Subjects. A Return to an Order of the House dated the 18th day of February last, for a Return of the Balance of the Funds so provided by the Government of France, which remains unappropriated to the liquidation of such Claims, including all Interest accuring thereon, up to the date of the Return. An Account of all Soap made in each town in Great Britain in the years 1827, 1828 and 1829 respectively, distinguishing the hard from the soft Soap; and specifying the total quantity made in each year. An Account of the total quantities of Soap exported from Great Britain in each of the years 1827, 1828 and 1829, distinguishing the hard from the soft Soap; showing the total quantities exported in each year, and specifying the particular quantities exported from the ports of Glasgow, Bristol, Liverpool and London. An Account of the total amount of Duty repaid in the shape of Drawback upon Soap exported from Great Britain in each of the years 1827, 1828 and 1829; distinguishing the amount repaid upon each description of Soap; and specifying the particular amount so repaid at the ports of Glasgow, Bristol, Liverpool and London. An Account of the Allowances made to the Manufacturers of Silks, Woollens and Linens in each of the years 1827, 1828 and 1829; distinguishing the hard from the soft Soap. An Account of the total quantity of Soap, distinguishing the hard from the soft, exported to Ireland, during each of the years 1827, 1828 and 1829; showing the several ports in Great Britain from which and the several ports in Ireland to which exported. An Account of the Contract Prices of Meat per pound, and of Bread per four-pound Loaf in England and Scotland, from the year 1819 to the close of 1829, so far as relates to the Commissariat Department. Return to an Order of the House, dated the 12th day of this instant March, for a Return of the total number of the Officers and Clerks of the Commissariat Establishment on 1st January 1817, 1822 and 1823; stating the number of each class then in Commission or employment, and the numbers on the Half Pay; stating also the aggregate amount of the Half Pay at each of these periods. Returns to an Order of the House, dated the 12th day of this instant March, for a Return of the number of Persons admitted to the Commissariat Establishment in each year since 1822, and the number of Promotions that have been made in each class in each year since 1822. A Return of the number of Passengers to and from Ireland by the Liverpool Government Packets in the year 1810, and in each year to 1829; distinguishing the Deck and Cabin Passengers, so far as the same can be made out:-And then he withdrew. Ordered, That the said Accounts and Papers do lie upon the Table; and, except the Returns relative to French Claims, be printed. The House being informed that Mr. Irving, Inspector General of Imports and Exports, attended at the door he was called in; and at the bar presented to the House, pursuant to the directions of an Act of Parliament,-Accounts of the Trade and Navigation of the United Kingdom, for three years ending the 5th of January 1830:- And then he withdrew. Ordered, That the said Accounts do lie upon the Table; and be printed. The House proceeded to take into consideration the Message from the Lords of Tuesday last, which requests that this House will be pleased to communicate to their Lordships, a Copy of a Report made by the Select Committee appointed by this House in Session 1828, on the Laws relating to Irish and Scottish Vagrants. Ordered, That a printed Copy of the said Report be communicated to the Lords, as desired by their Lordships in their said Message; and that Sir Alexander Grant do deliver the same. A Petition of Inhabitants of Bingley;-of the Woollen and Worsted Manufacturers and others of Bowling, Bradford and East Bierley;- of Birstall and Gomersall;-of Inhabitants of the city, bail and close of Lincoln, and the neighbourhood thereof;-of the Woollen and Worsted Manufacturers and others of Gildersome, Drighlington and Tong;-of Kirkstall, Woodhouse and Chapel Allerton; -of Holbeck;-of Cleckheaton, Wike, Hunsworth and North Bierley;-of Wortley and Farnley;-of Hunslett; -of Eccleshill, Windhill and Shipley;-of Yeadon and Guiseley;-of Bolton;-of Sale, Baildon and Heaton;-of Horsforth and Rawden;-of Thornhill;-of Calverley and Farsley;-of Batley and Heckmondwike;-of Churwell and Morley;-of Horbury;- of Owners and Occupiers of land, Farmers, and other Inhabitants of Aberford;- of Garforth, in the line of the proposed Railway from Leeds to Selby;- of Merchants, Manufacturers, Tradesmen and other Inhabitants of Leeds;-of Inhabitants of Skipton;- and, of Merchants, Ship-owners and Traders of the city of London,-were presented, and read; taking notice of the Bill for making a Railway from the Town of Leeds to the River Ouse, within the Parish of Selby, in the West Riding of the County of York; and praying, That the same may pass into a law. 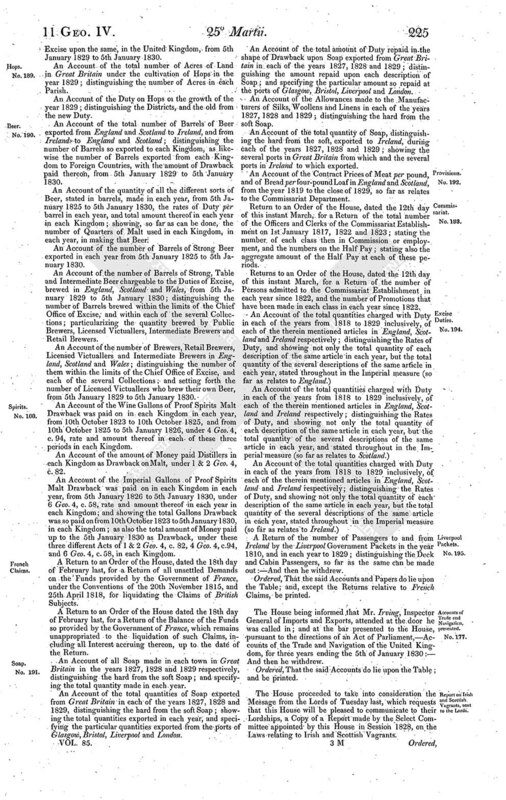 A Petition of the Heritors, Minister and Elders, Farmers and Householders of the parish of Dyke; was presented, and read; taking notice of the Bill for rebuilding the Bridges over the Rivers Spey and Findhorn, for making Accesses thereto, and for making and maintaining certain new Roads in the County of Elgin; and praying, That the same may not pass into a law as it now stands. Sir Edward Knatchbull reported from the Committee on the Petition of several Inhabitants of the Parish of Greenwich, in the county of Kent, and the Vicar and Churchwardens and Overseers of the Poor of the said Parish, and several of the Feoffees in trust of certain estates in the said parish and elsewhere, formerly belonging to John Roan, Esquire, and others, for leave to present a Petition; That they had examined the matter thereof; and the Report was brought up, and read. A Petition of the said several Persons was accordingly presented, and read; containing the same allegations as their former Petition; and praying, That leave may be given to bring in a Bill for the Improvement of the Town of Greenwich, and for the regulation of certain Charities therein. Ordered, That the said Petition be referred to a Committee; and it is referred to Sir Edward Knatchbull, &c.: And they are to meet To-morrow, in the Speaker's Chamber; and have Power to send for persons papers and records. A Petition of the Merchants House of Glasgow, was presented, and read; taking notice of the Bill for extending the Royalty of the City of Glasgow over the Lands of Blythswood and adjacent Lands, and for amending the Acts relating to the Police of the said City; and praying, That they may be heard by themselves, their counsel or agents against certain parts thereof. A Petition of Owners and Occupiers of water-mills and other works upon the River Rivelin, in the parish of Sheffield, in the county of York, and of other water-mills upon the Rivers Loxley and Dun, deriving a supply of water from the said River Rivelin, was presented, and read; taking notice of the Bill for better supplying with Water the Town and Parish of Sheffield, in the County of York; and praying, That they may be heard by themselves, their counsel or agents against certain parts thereof. A Petition of Trustees for making and maintaining the several Turnpike Roads from Holme-lane End to Heckmondwike, and from Gomersal to Dewsbury, all in the west riding of the county of York;-of Owners and Occupiers of land and tenements, Merchants, Manufacturers and Traders residing in the several townships of Gomersal and Batley;-and, in Dewsbury, Soothill, Ossett and Horbury,-were presented, and read; taking notice of the Bill for making and maintaining a Road from Dewsbury to Horbury Bridge, in the West Riding of the County of York, with a Branch Road therefrom; and praying, That the same may pass into a law. Lord Stanley reported from the Committee on the Bill for dividing and inclosing certain Moss and other Grounds, in the Townships of Out Rawcliffe and Middle Rawcliffe, and Stalmine-with-Stainhall, in the Parishes of Saint Michael-upon-Wyer and Lancaster, in the County Palatine of Lancaster; That the Standing Orders relative to Bills of Inclosure, had been complied with; and that they had examined the allegations of the Bill, and found the same to be true; and that the Parties concerned had given their consent to the Bill, to the satisfaction of the Committee; and that they had gone through the Bill, and made several Amendments thereunto; and the Amendments were read, and agreed to by the House. A Petition of Trustees for executing an Act for more effectually repairing and improving the Roads from Boltonle-Moors to the Turnpike Road in Parr, leading from Saint Hellen's to Ashton, all in the County Palatine of Lancaster, was presented, and read; taking notice of the Bill for making and maintaining a Railway from the Borough of Wigan to the Liverpool and Manchester Railway, in the Borough of Newton, in the County Palatine of Lancaster, and collateral Branches to communicate therewith; and praying, That they may be heard by themselves, their counsel or agents against certain parts thereof. A Petition of William Blount, acting under a power of attorney from the Earl of Shrewsbury, and Thomas Hart, was presented, and read; taking notice of the Bill to consolidate and extend the Powers and Provisions of the several Acts relating to the Navigation from the Trent to the Mersey; and praying, That they may be heard by their counsel or agents against certain parts thereof. Mr. Alderman Thompson reported from the Committee on the ingrossed Bill from the Lords, intituled, An Act for naturalizing John Anthony Fructuozo; That they had examined the allegations of the Bill, and found the same to be true; and had gone through the Bill, and had directed him to report the same to the House without any Amendment; and the Bill was read the third time. Ordered, That Mr. Alderman Thompson do carry the Bill to the Lords, and acquaint them that this House hath agreed to the same without any Amendment. A Bill for making and maintaining a Road from Dewsbury to Horbury Bridge, in the West Riding of the County of York, with a Branch Road therefrom, was read a second time; and committed to Mr. Marshall, &c.: And they are to meet this Afternoon, in the Speaker's Chamber. 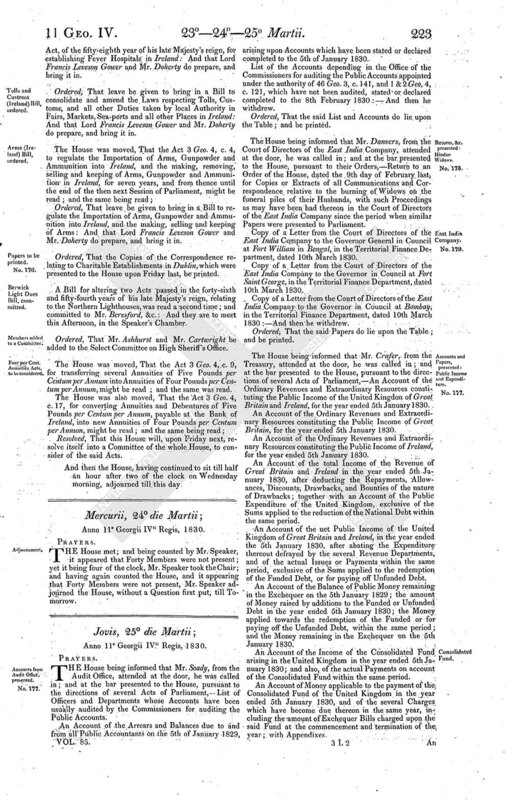 A Bill to enable the Commissioners of Wide Streets to widen and improve certain Ways, Streets, and Passages in and about the City and County of Dublin; and to amend and extend the Provisions of an Act passed in the forty-seventh year of the reign of his late Majesty, for improving and rendering more commodious such parts of the County, and County of the City of Dublin, as are situate on the South side of the River Anna Liffey, and West of His Majesty's Castle of Dublin, was read a second time; and committed to Mr. Moore, &c.: And they are to meet this Afternoon, in the Speaker's Chamber. Mr. Kilderbee reported from the Committee on the Bill for continuing and rendering more effectual the several Acts passed for improving the Harbour of Southwold, in the County of Suffolk; That they had examined the allegations of the Bill, and found the same to be true; and had gone through the Bill, and made several Amendments thereunto; and the Amendments were read, and agreed to by the House. A Petition of the Preceptor and Patrons of Hutchison's Hospital, in the city of Glasgow, was presented, and read; taking notice of the Bill for amending and continuing an Act for repairing Roads in the county of Renfrew, and for altering the Line of Road between Glasgow and Kilmarnock, in the said county; and praying, That they may be heard by themselves, their counsel or agents against certain parts thereof. A Petition of the Trustees for repairing the Road leading from the city of Glasgow, through Cowcaddens, to the north end of the Bridge over that part of the River Kelvin called the Milnford of Garscube, in the county of Lanark; -and, of Archibald Campbell, a Trustee for repairing and maintaining the Roads from Inchbelly Bridge to Glasgow, and leading over Garngadhill to Provan Mill, and other Roads branching therefrom or connected therewith,- were presented, and read; taking notice of the Bill for making a Railway and Tunnel from the Broomielaw Harbour of Glasgow, to communicate with the Canals and Railways passing by, or terminating at, the higher Levels towards the North and North-east of the said City of Glasgow; and praying, That they may be heard by themselves, their counsel or agents against certain parts thereof. Lord William Powlett reported from the Committee on the Bill for maintaining the Road from Catterick Bridge, in the County of York, by the Towns of Yarm and Stockton, and through the Town of Sedgefield, to the City of Durham; That the Standing Orders relative to Turnpike Bills, had been complied with; and that they had examined the allegations of the Bill, and found the same to be true; and had gone through the Bill, and made several Amendments thereunto; and the Amendments were read, and agreed to by the House. Mr. Thomas Wood reported from the Committee on the Petition of Edward Frere, of Clydach Iron Works, in the parish of Llanelly, in the county of Brecon, Iron-master; That the Standing Orders relative to Turnpike Bills, had been complied with, so far as regards the Line proposed by the Petition to be made; except that the duplicate of the Plan and Book of Reference deposited with the Clerk of the Peace, and the Lists of Owners and Occupiers assenting, dissenting and neuter, and also the Estimate and Subscription List, had not been deposited in the Private Bill Office previously to presenting the Petition for the Bill; and it appeared that the intended Line would be more convenient to the public if the same were made according to the plan proposed by the Petitioner, than if the same were made according to the plan originally proposed by the promoters of the Bill, inasmuch as the necessary ascent, in a considerable proportion of the proposed Line, will be reduced from one inch and three quarters in a yard to three quarters of an inch, and will open a more easy communication between the markettown of Crickhowell and a large and populous district; and that they had examined the matter of the Petition; and the Report was brought up, and read. Ordered, That the Report be referred to the Select Committee on Standing Orders. A Petition of Inhabitants of the several parishes of Bradford, Wingfield, North Bradley, Trowbridge, Westbury, Hilperton, Steeple Ashton, and Edington, situate in the hundreds of Bradford, Melksham, Worlesdown, and Westbury, in the county of Wilts, was presented, and read; taking notice of the Bill for more effectually repairing and otherwise improving several Roads from Radstock to Buckland, Dinham, Kilmersdon, Babington and Hallatrow, and from Norton Down to Norton Saint Philip, in the County of Somerset; and praying, That the same may not pass into a law as it now stands. Ordered, That the Committee on the Bill for making a Railway and Tunnel from the Broomielaw Harbour of Glasgow, to communicate with the Canals and Railways passing by or terminating at the higher Levels towards the North and North-east of the said City of Glasgow, have leave to sit, notwithstanding any adjournment of the House. A Petition of Inhabitants of the clothing district of Bowling and Bierley;-of Gomersal;-of Wortley;-and, of Merchants, Manufacturers and Inhabitants of the town of Newcastle-upon-Tyne,-were presented, and read; praying, That the House will not renew the East India Company's exclusive privileges of trade without the clearest and most unanswerable proof that they directly promote the benefit of His Majesty's subjects in general; and that to refuse to renew them would be an injury to the nation at large. A Petition of Inhabitants of the clothing district of Holbeck, in the county of York, was also presented, and read; praying, That a free trade with China, particularly in tea and woollens, as well as the right of trading and settling in India, may be granted to all His Majesty's subjects. Resolved, That an humble Address be presented to His Majesty, that He will be graciously pleased to give directions, that there be laid before this House, a Copy of a Circular addressed by Mr. Peel to different Public Offices in favour of the Society for superseding Climbing Boys, by the use of Machinery:-A List of Public Offices to which the same was addressed:-also, the number of Flues in each that have been cleansed by the Machine, or swept by Boys, since the date of the Circular; showing also in which of such buildings the agents of the Society for superseding Climbing Boys, or Sweeps that keep Boys, are employed. A Petition of the Licensed Victuallers of Bristol and its suburbs, was presented, and read; setting forth, That the Petitioners feel greatly alarmed at learning, as they do from the public papers, that a serious proposition has been made to extend the allowance to sell Beer to other than Licensed Victuallers and Retail Brewers; and that if, notwithstanding what the Petitioners show, the House should determine to sacrifice the Petitioners to the hypothetical good expected to result from an open trade in Beer, the Petitioners pray that their license duty might be taken off; that they might be relieved from the billeting His Majesty's troops, and from magisterial interference; and also that the new retailers might be surveyed as closely as themselves, an equality of circumstances perfectly overlooked in legislating upon the sale of Cider. A Petition of Owners and Occupiers of land in the parishes of Swinnerton and Stoke-upon-Trent, in the county of Stafford;-of Freeholders and other Inhabitants of the county and city of Worcester;-and, of the county of Denbigh,- were presented, and read; praying, That the House will be pleased to institute a full and strict inquiry into the causes of the present distress, and especially as to the effect produced by the alteration of the currency, and that the House will adopt such standard of value as shall, on investigation, be found to be just and equitable. The Lords have commanded us to acquaint this House, That the Lords do request that this House will be pleased to communicate to their Lordships, a Copy of the Evidence upon which this House passed the Bill, intituled, An Act to prevent Bribery and Corruption in the election of Burgesses to serve in Parliament for the Borough of East Retford:-And then the Messengers withdrew. Resolved, That this House will send an Answer to so much of the said Message as relates to the Report from the Select Committee on the Eighteenth Report of the Commissioners of Judicial Inquiry in Ireland, and the Deposition forwarded to those Commissioners by Sir Jonah Barrington; and also, to the evidence upon which this House passed the Bill respecting the East Retford Election, by Messengers of their own. 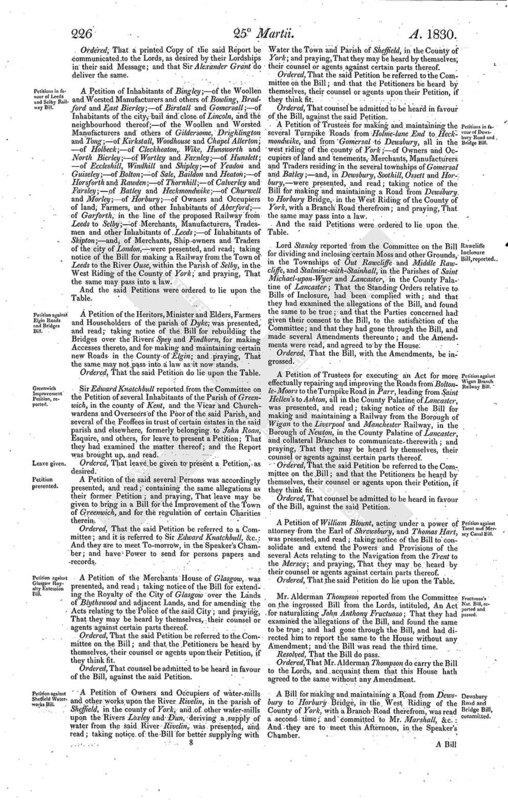 A Petition of Inhabitants of the town of Birmingham and its neighbourhood;-and, of Gunmakers of London concerned in the manufacture of small arms,-were presented and read; setting forth, That the Petitioners have heard with considerable alarm and regret, that measures are about to be adopted by His Majesty's Honourable Board of Ordnance for abandoning the establishment for proof of small arms in Birmingham, and for removing the same to the manufactory for the fabrication of arms established by the Board at Enfield, which is conducted altogether by their own servants, whereby the Petitioners conceive that this branch of trade will be most injuriously affected, and ultimately annihilated; and praying, That the House will be pleased to take such measures as to them may seem proper for obtaining the abandonment of the Royal Manufactory of Arms at Enfield, and thereby securing to the Petitioners such further protection and encouragement as may be compatible with the public interest. A Petition of Protestant Dissenters assembling at the Chapel in Worship-street, near Finsbury-square, London;- and, of Inhabitants of Bridport and its vicinity,- were presented, and read; setting forth, That the Petitioners, impressed with the benefit of a Criminal Code founded on the immutable principles of justice and mercy, awarding punishment adequate to the nature of the offence, beg leave to address the House on the subject of inflicting the penalty of Death for the crime of Forgery; and praying, That they will take this very important subject into their serious consideration, and adopt such measures of retributive justice as may tend to prevent the invasion of property, promote the reformation of the offender, and otherwise advance the true interests of the nation. A Petition of several Manufacturers of Flour, was presented, and read; setting forth, That the Petitioners humbly implore the House to allow them the same privilege as enjoyed by other manufacturers, by which means a great number of Petitioners' mills may be constantly employed to the greatest possible advantage for supplying our colonies with flour, and of such qualities as no other country can produce, and that entirely from the superiority of manufacture; the Petitioners therefore beg leave to suggest to the wisdom of the House, that, in lieu of a drawback which other manufacturers enjoy according to the duty of importation, a Clause be inserted in the Corn Bill, that the Petitioners pay a duty of 4s. per quarter upon taking Wheat out of bond or ship on arrival, only allowing the offal from the same for home consumption, which, taking the average weight of foreign Wheat at 59 pounds per bushel, would not exceed 9 pounds per bushel, which offal the Petitioners can assure the House is of great advantage to the agriculturists, and more particularly the labouring poor of all classes in rearing their live stock of every description; and the Petitioners beg further to suggest to the House, that to prevent any frauds in the substitution, every miller, previous to grinding foreign Wheat, shall give seven days notice to the Customs, so that an officer may see that such mill or mills are cleared previous to receiving the foreign Wheat, and, during such Wheat being manufactured, that no corn whatever may be admitted to the said mill or mills, but as soon as manufactured may, under the inspection of the officer, be either re-bonded or shipped for exportation as Flour, Meal or Biscuit; and praying the House to take into serious consideration the prayer of this Petition, and they trust to the wisdom of the House for a speedy and sufficient relief. 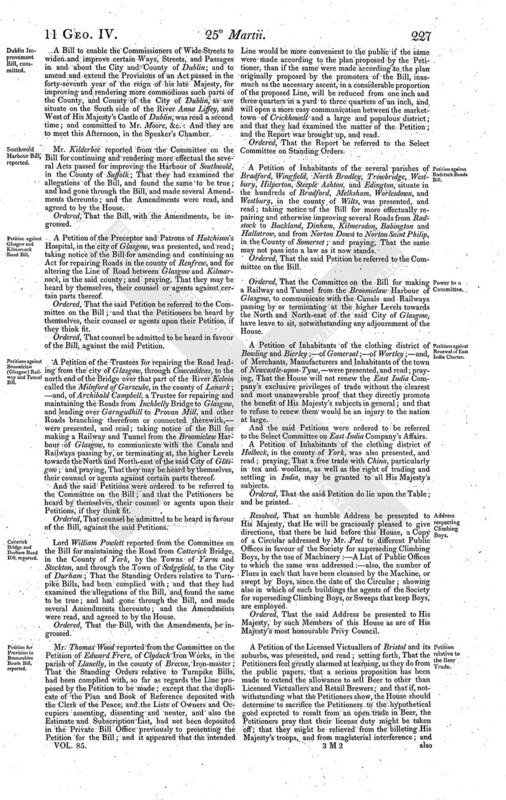 Mr. William Smith presented to the House, pursuant to the directions of an Act of Parliament,-The Sixteenth Report of the Commissioners for the Repair of Roads and Bridges in the Highlands of Scotland. A Petition of Trivet Allcock, of the city of Norwich, was presented, and read; setting forth, That the Petitioner believes that religious toleration, in its fullest extent, is one of the most powerful guarantees of social tranquillity, and that there cannot be a greater impiety than to deprive any body of men of their civil rights, be their religious opinions what they may; that actions, and not opinions, are what he considers men ought to be judged by, and that it is the excess of injustice to punish on account of the latter; that every age and country furnish proofs that people of the greatest diversity of tenets can live in harmony together, and be alike good husbands, fathers, children and citizens; the Petitioner therefore prays the House to repeal all the penal Laws affecting the Jews, a people professing a religion which Christians know was formerly dear to God. Ordered, That the Petitions of the Inhabitants of the northern; and, of the eastern division of the city of London, professing the Jewish Religion, which were presented to the House upon Tuesday last, be printed. Ordered, That the Petition of Thomas Flanagan, for the repeal of so much of the Irish Naturalization Act 23 & 24 Geo. 3, as excludes the Jews settling in Ireland, and for extending to them political privileges, which was presented to the House upon Tuesday last, be printed. A Petition of Letter-press Printers of the town of Sheffield, was presented, and read; praying for a reduction of the present Newspaper Stamp Duty from 4d. to 2d. as well as that of the Advertisement Duty from the present sum of 3s. 6d. charged upon each, to the sum of 2s., or to such reduced sum as the House shall deem advisable. And the House being informed that Mr. Miller attended at the door, he was called in; and at the bar examined upon oath, and stated, that on the day preceding the day on which the Petition was presented, he saw Colonel Evans, when he asked him for the names of the Sureties to be proposed to enter into their recognizance in respect of the Rye Election Petition, and that Colonel Evans gave him the name of Colonel Money as one of the Sureties; that he (Mr. Miller) was not aware that it was necessary to have Sureties for both Petitions; that, when he was informed that it was necessary, Colonel Evans stated, that, as Colonel Money had consented to be one of two Sureties, he considered his consent would apply to both Petitions, and his name was given in accordingly:- And then he withdrew. And the House being informed that Colonel Evans attended at the door, he was called in; and at the bar examined upon oath, and stated, that Colonel Money having generally consented to be one of two Sureties on the Rye Election Petition, he considered he was not acting contrary to Colonel Money's intention, by giving in his name as one of the Sureties on the Petition signed by the Electors:-And then he withdrew. Ordered, That time be given to enter into the Recognizance till Saturday sevennight, and leave to substitute another proposed Surety. Tellers for the Yeas, Mr. Poulett Thomson, 78. Tellers for the Noes, Mr. George Dawson, 167. A Bill to confirm certain Leases of Lands for the purposes of carrying on the Linen Manufacture of Ireland, was, according to Order, read a second time; and committed to a Committee of the whole House for this day. Ordered, That the Bill be read a second time upon Thursday next. 1. Resolved, That it is the opinion of this Committee, that a sum, not exceeding Two hundred thousand pounds, be granted to His Majesty towards defraying the expense of the Royal Regiment of Artillery for Great Britain, Ireland, and the Colonies, for the year 1830. 2. Resolved, That it is the opinion of this Committee, that a sum, not exceeding Fifty-two thousand two hundred and sixteen pounds five shillings and one penny, be granted to His Majesty, to defray the Salaries of the Officers, and the contingent Expenses of the Admiralty Office, for the year 1830. 3. Resolved, That it is the opinion of this Committee, that a sum, not exceeding Thirty-two thousand and thirtythree pounds one shilling and sixpence, be granted to His Majesty, to defray the Salaries of the Officers and the contingent Expenses of the Navy Pay-Office, for the year 1830. 4. Resolved, That it is the opinion of this Committee, that a sum, not exceeding Six hundred and three thousand and two hundred pounds, be granted to His Majesty, for Victuals for the said Twenty-nine thousand men, at the rate of One pound twelve shillings per man per month. The first Resolution of the Committee being read a second time, was agreed to by the House. Then the subsequent Resolutions of the Committee being read a second time, were postponed. Ordered, That the Resolutions which have been postponed, be taken into further consideration this day. The ingrossed Bill to indemnify such Persons in the United Kingdom as have omitted to qualify themselves for Offices and Employments, and for extending the Time limited for those purposes respectively; and to permit such Persons in Great Britain as have omitted to make and file Affidavits of the execution of Indentures of Clerks to Attornies and Solicitors, to make and file the same, and to allow Persons to make and file such Affidavits, although the Persons whom they served shall have neglected to take out their annual Certificates, was, according to Order, read the third time. 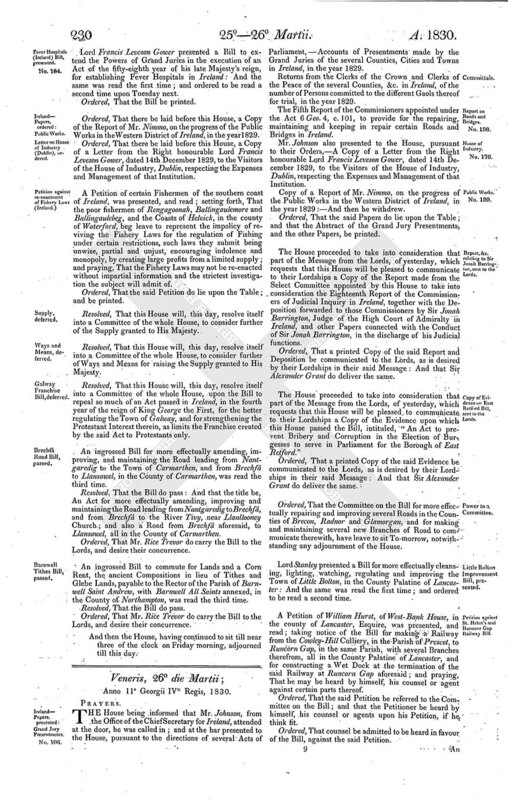 Resolved, That the Bill do pass: And that the Title be, An Act to indemnify such Persons in the United Kingdom as have omitted to qualify themselves for Offices and Employments, and for extending the Time limited for those purposes respectively, until the Twenty-fifth day of March One thousand eight hundred and thirty-one; to permit such Persons in Great Britain as have omitted to make and file Affidavits of the execution of Indentures of Clerks to Attornies and Solicitors, to make and file the same on or before the first day of Hilary Term One thousand eight hundred and thirty-one, and to allow Persons to make and file such Affidavits, although the Persons whom they served shall have neglected to take out their Annual Certificates. Ordered, That Lord Francis Osborne be added to the Select Committee on the Sale of Beer. Ordered, That Mr. Bonham Carter be added to the Select Committee on the Office of High Sheriff. Lord Francis Leveson Gower presented a Bill to regulate the Importation of Arms, Gunpowder and Ammunition into Ireland, and the making, selling and keeping of Arms: And the same was read the first time; and ordered to be read a second time upon Thursday next. Lord Francis Leveson Gower presented a Bill to consolidate and amend the Laws respecting Tolls, Customs, and all other Duties taken by local Authority in Fairs, Markets, Sea-ports, and all other Places in Ireland: And the same was read the first time; and ordered to be read a second time upon Thursday next. Lord Francis Leveson Gower presented a Bill to extend the Powers of Grand Juries in the execution of an Act of the fifty-eighth year of his late Majesty's reign, for establishing Fever Hospitals in Ireland: And the same was read the first time; and ordered to be read a second time upon Tuesday next. Ordered, That there be laid before this House, a Copy of the Report of Mr. Nimmo, on the progress of the Public Works in the Western District of Ireland, in the year 1829. Ordered, That there be laid before this House, a Copy of a Letter from the Right honourable Lord Francis Leveson Gower, dated 14th December 1829, to the Visitors of the House of Industry, Dublin, respecting the Expenses and Management of that Institution. 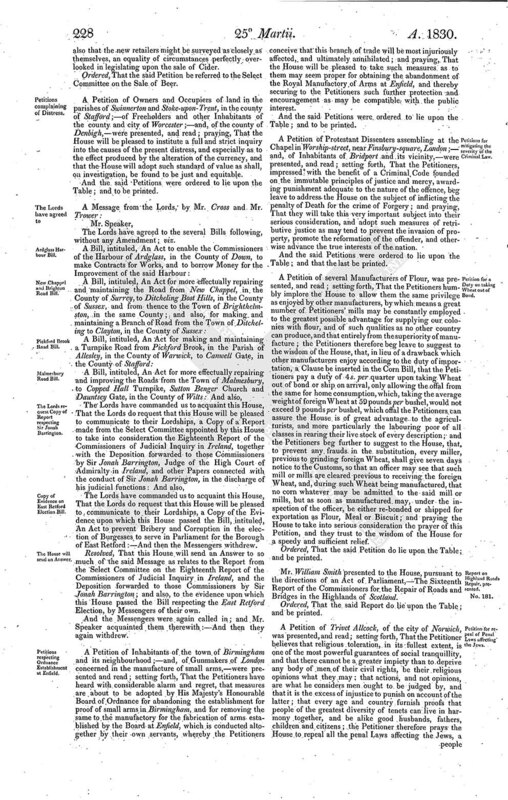 A Petition of certain Fishermen of the southern coast of Ireland, was presented, and read; setting forth, That the poor fishermen of Rengagoonah, Ballingaulemore and Ballingaulebeg, and the Coasts of Helvick, in the county of Waterford, beg leave to represent the impolicy of reviving the Fishery Laws for the regulation of Fishing under certain restrictions, such laws they submit being unwise, partial and unjust, encouraging indolence and monopoly, by creating large profits from a limited supply; and praying, That the Fishery Laws may not be re-enacted without impartial information and the strictest investigation the subject will admit of. Resolved, That this House will, this day, resolve itself into a Committee of the whole House, to consider further of the Supply granted to His Majesty. Resolved, That this House will, this day, resolve itself into a Committee of the whole House, to consider further of Ways and Means for raising the Supply granted to His Majesty. Resolved, That this House will, this day, resolve itself into a Committee of the whole House, upon the Bill to repeal so much of an Act passed in Ireland, in the fourth year of the reign of King George the First, for the better regulating the Town of Galway, and for strengthening the Protestant Interest therein, as limits the Franchise created by the said Act to Protestants only. An ingrossed Bill for more effectually amending, improving, and maintaining the Road leading from Nantgaredig to the Town of Carmarthen, and from Brechfâ, to Llansawel, in the County of Carmarthen, was read the third time. Resolved, That the Bill do pass: And that the title be, An Act for more effectually amending, improving and maintaining the Road leading from Nantgaredig to Brechfâ, and from Brechfâ to the River Tivy, near Llanllooney Church; and also a Road from Brechfâ aforesaid, to Llansawel, all in the County of Carmarthen. Ordered, That Mr. Rice Trevor do carry the Bill to the Lords, and desire their concurrence. An ingrossed Bill to commute for Lands and a Corn Rent, the ancient Compositions in lieu of Tithes and Glebe Lands, payable to the Rector of the Parish of Barnwell Saint Andrew, with Barnwell All Saints annexed, in the County of Northampton, was read the third time. And then the House, having continued to sit till near three of the clock on Friday morning, adjourned till this day.